Tearing yet another page from the "We'll write about anything" folder, today's post spotlights Men of Wrath, a 2014 comic book written by Jason Aaron, with art by Ron Garney. Picking up the series on a whim, I found myself very surprised to be greeted with the above quote, found on the inside cover for the first issue. These brutal lyrics set the tone for the book, which covers the Rath family, and the inescapable violence that haunts their lives. 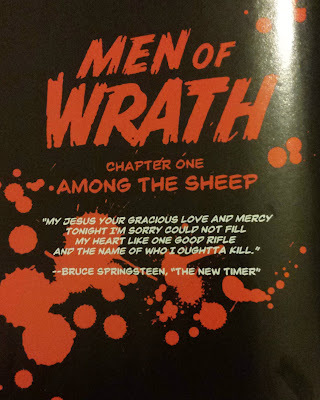 Interestingly enough, "The New Timer" is about a man working various jobs, including picking peaches, something Tom Joad did in The Grapes of Wrath (creating a connection back to the comic's title). Admittedly, "The New Timer" is not in my general Springsteen rotation. In fact, I rarely find myself listening to The Ghost of Tom Joad at all (and I doubt I'm alone in this). With the 20th anniversary of the album coming up next month, perhaps it is worth going back to for another listen.